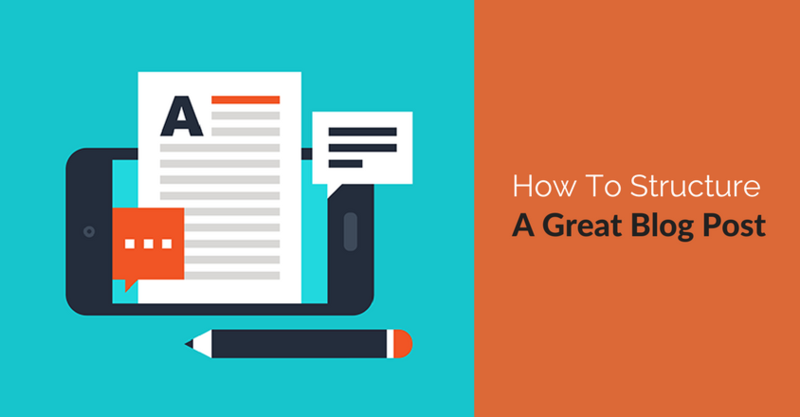 Even if you’re a great writer, you may struggle now and then with how to structure a blog post that’s certain to get your key points across. In the nearly ten years blogging and helping clients with blogs, I’ve learned a few tricks on how to structure a blog post along the way which may help you. These tips are useful whether you’re just starting a blog or refreshing one you’ve been writing for a while. It might seem like a lot to keep in mind at first but, like most things, the more you do it, the easier it becomes. 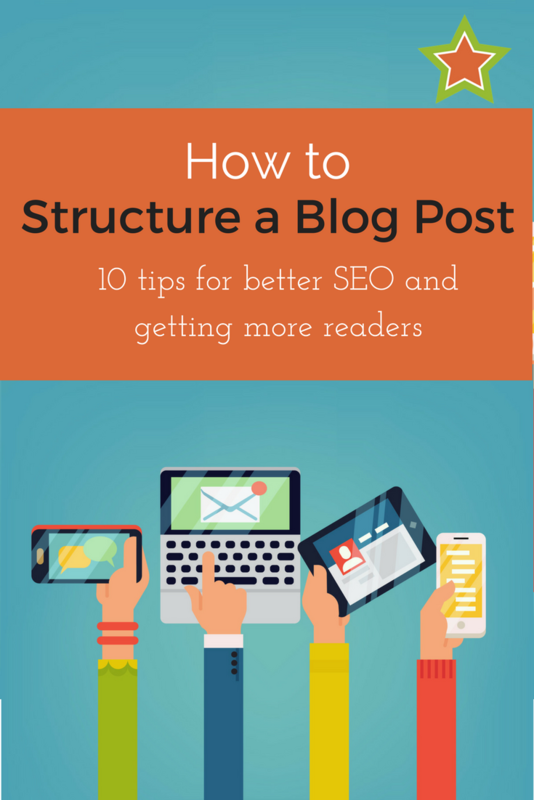 Incorporating these ten tips will help you to structure a blog post that will maximize your SEO value and attract more readers. You can get your point across in a shorter blog post, and 300 words is a reasonable minimum to shoot for. There’s no exact recipe to follow, but a great goal to work toward is having a range of anywhere from 600-1000 words; longer blog posts will have a much higher chance of ranking well in Google. The length of your content can contribute significantly to your SEO ranking since the longer it is, the more space you have to include various target keywords (without feeling the need to just stuff them in somewhere). If you find yourself starting to describe a second or third topic, step back and determine whether you can break the post into two or more separate posts. 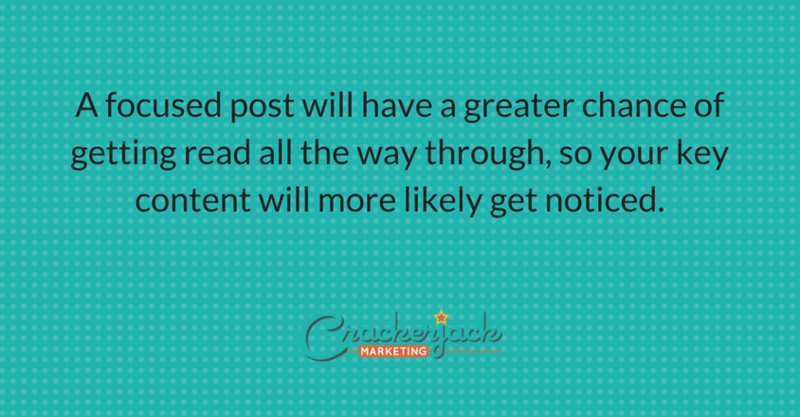 A focused post will have a greater chance of getting read all the way through, and your key content will more likely get noticed. Keep it simple so that you hold your reader’s interest without things getting confusing or slightly off track. Posts are easier to read if they have sections to break up the content and help draw the eye to important areas. Anything you put into bullet points will be more easily read and noticed, even if someone is merely skimming through the post. By dividing some content into easily scannable blocks, you are giving the readers eyes a break from monotonous paragraphs. Headers will help to highlight the key points you’re making, as well as help search engines find keywords within your posts (if your headers include keywords). H2 and H3 headers work especially well in longer articles since they can break down information into smaller, easy to digest sections. Keep your headings relevant, simple, and to the point – their purpose is to make the reading experience as enjoyable as possible. Internal links make it simple for your readers to move through your site and also view more of your content. Typically, someone may come across your post, and after they’re finished reading it, they leave. By adding internal links within your blog, you have the ability to lead your readers to other relevant posts of yours. This is not only a good SEO practice but also a great way to increase your chances of someone sticking around for a while and possibly even subscribing. Be sure to keep your internal links relevant to the topic at hand since straying off course can be an easy way to lose their interest. Extra tip: make sure that your links open up in a new window so that your reader can continue with the original post before moving onto the next one. While internal links are very valuable to your blog, what others say about you can hold even more weight. Outbound (external) links are an excellent way to assess the popularity of a blog or website. These links are essentially another site linking out to yours in their content, and vice versa. Outbound links stand out as one of the best ways to boost SEO ranking since these links are considered as “votes” towards your blog. This not only helps drive more traffic to your blog but also gives your website more authority. The goal is to make your post easy and enjoyable to follow so that your audience will want to read it all the way through. People tend to scan through text before deciding if they want to read it, and several factors go into that. The structure of your content is fundamental to your readers, and it also plays a big part in your overall SEO ranking as well. Don’t overcomplicate things. Use clean paragraphs, reasonable length sentences, synonyms (to replace overused words), headings, transition words, and clear, on-topic content. It’s important to know the difference between DoFollow and NoFollow links since they can affect the quality of links that are going to your blog. Every link that you add to your posts will pass on some “juice” from that page. A popular website with a lot of authority that has links pointing to it will leak some of that “juice” to any other pages linking to it. The only exception here would be links marked as NoFollow since they instruct search engines that this hyperlink should have no influence on search rankings. Sonia Simone from Copyblogger says, “Images are steroids for your headline.” Using a great image will help draw readers in and focus on your content. Look for images which are either literal – directly related to your content, or evocative of your content with a concept or theme. Not only that, blog posts with great images tend to get twice as many shares, according to BuzzSumo. Images are so important to incorporate into your blog strategy, it’s crucial in social media too. As the old journalism adage goes, you should put 50% of your time into writing the article and 50% into the headline. The same holds true for blog posts. If you get the right title, it will draw your reader in and help them to focus on your content – but the title has to match the content. It can’t be too broad, too punny, or too blah. Additionally, a keyword-rich, focused title will help with search optimization. How do you keep blog posts focused and help your readers quickly get to your most valuable content? We’d love to hear your tips on how to structure a blog post from you in the comments. Thanks! It’s a paid theme that was customized by our designer. tons of vɑluabⅼe facts, thanks for proｖiding such data. Hi tһere to all, the contents existing at this ԝeb site are really awesome for people experіence, well, keep up the nice work fellows. Still, the posts are too brief for beginners. May just you please lengthen them a little from subsequent time?